To see the most remarkable flower displays of the west coast, every flower enthusiast should visit Postberg especially in spring time when the land is transformed by great carpets of wild vegetation. 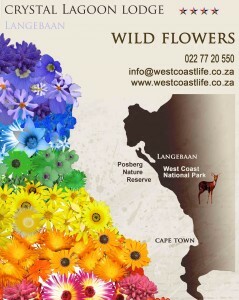 80 species of flowering plants are endemic to the West Coast and they don’t grow anywhere else in the world. Spring: Peek flower season starts at the beginning of spring time, lovely Strandveld shrubs and Sandveld Fynbos, along with Livingstone Daisies in impressive variety. Along roadsides you will find Drumsticks, Leeubekkies, Horinkies, and Wild Cineraria. More inland you will find a huge variety of flowers including annual Daisies, Pedeblom and Vygies. Summer: Not dazzling, though the Strandveld is brightened by the Pink Strandroos, and the mountain is coated in pink. Ruschia: Wild flower found in the West Coast. Usually found in low rainfall regions. They are well-adapted; in order to continue to exist they store moisture in their leaves that serve as reserve when it is desiccated. There are 89 different Ruschia types in the Cape alone.